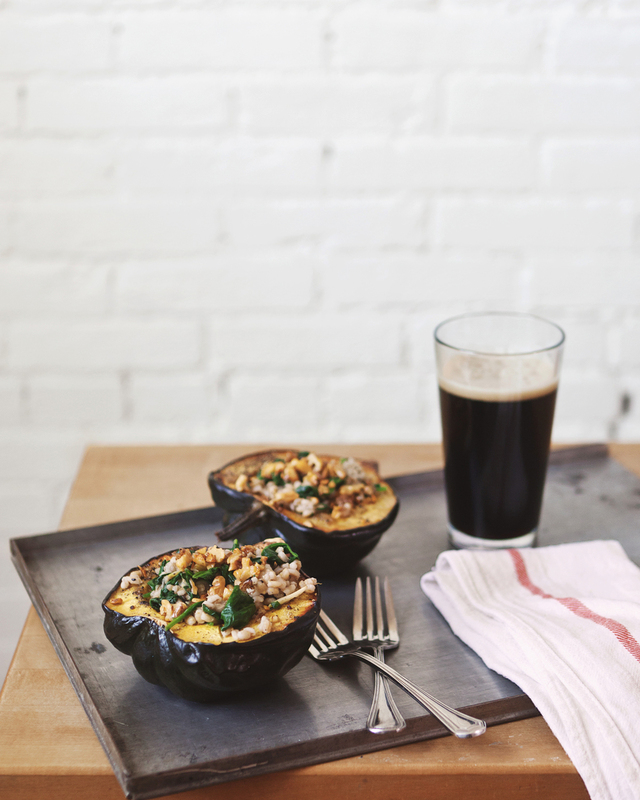 We've wrapped up the squash and pumpkin recipes for the Free People blog and are moving onto vegan Thanksgiving side dishes. This was by far my favorite recipe brainstorm recently. Robert and I, and little Miss Daisy- (who was probably more interested in staring at birds than coming up with recipe ideas) were sitting at a coffee shop drawing terrible looking pictures of acorn squash. We should roast it! We should stuff it! We should roast it and stuff it with a grain salad. Yes. It'll be like a bread bowl! Sort of. I like this recipe because I feel like you could reinvent it so many different ways. Use whatever you already have in your kitchen in terms of the greens and the grain. I liked the barley spinach combination a lot. We paired it with a dark Fall beer, which I'd definitely recommend since you won't be able to have that pairing for too much longer. 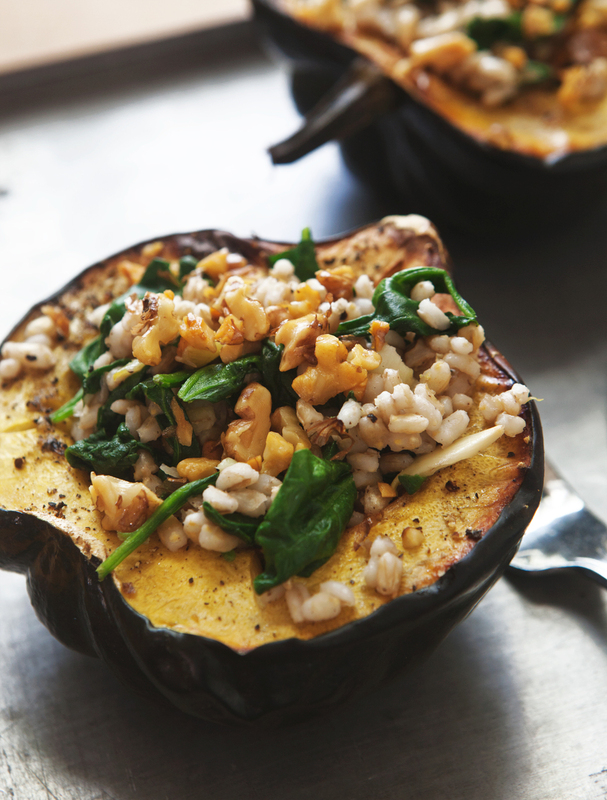 Once you get a big bite with the roasted squash, barley and greens the flavors all melt together and you'll finish the whole thing before you even realize. See the original post from the Bldg 25 blog here. Preheat oven to 400°. With a sharp knife, score a crosshatch pattern into the flesh of squash. Rub each half with butter, season generously with salt and pepper. In each squash, place 3 cloves of garlic. Roast for 1 hour. While squash is roasting, rinse barley until water runs clear. In a saucepan over high heat, bring barley and 1.5 cups of water to a boil, stir and reduce to a simmer. Cover and cook for 50 minutes. When finished, fluff with a fork and set aside. When the squash is finished roasting, remove the garlic cloves and mash them into a paste with fork. In a skillet over medium heat, heat 1/2 tbs olive oil. Add spinach, cooked barley, and roasted garlic paste. Cook until spinach is wilted and ingredients are combined. Season to taste with salt and pepper. 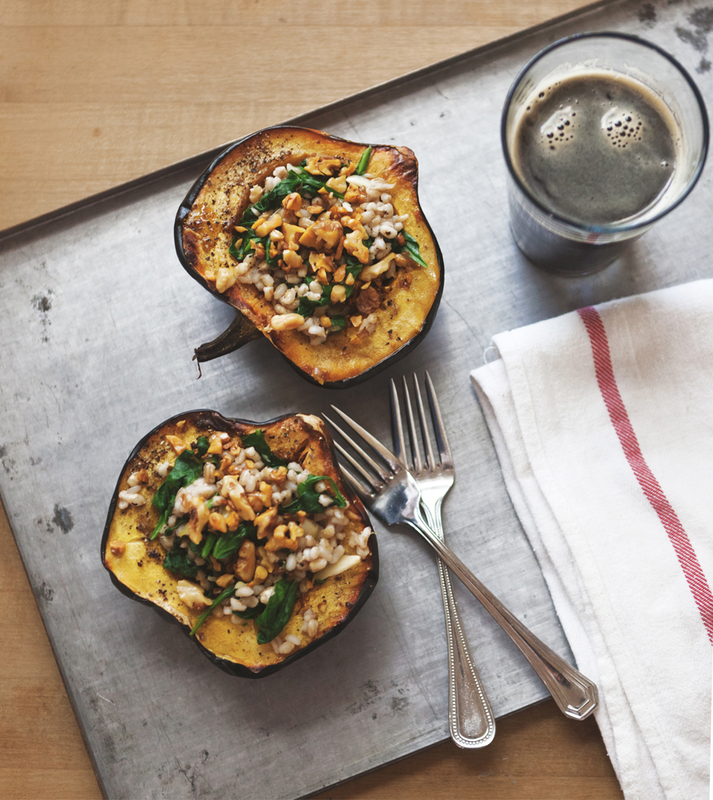 Divide between two halves of squash and top with toasted walnuts.